Published and printed by Bradshaw & Blacklock using George Baxter's patented Baxter Process. Size 9 x 7 inches approx. 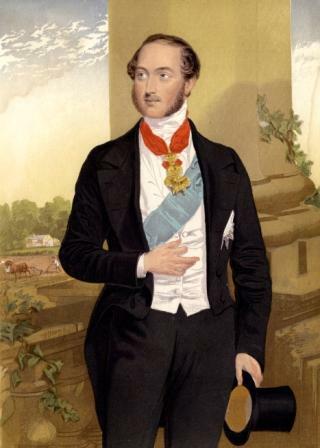 Prince Albert is wearing the Garter ribbon and star together with another order on a red ribbon around his neck. A model farm, which was a hobby of the Prince, is also visible in the background. Courtney Lewis thought it likely that this print was taken from a painting by W C Ross RA but it is not an exact copy. Its publication was advertised in 1854 in Bradshaw's Illustrated Travellers' Hand-book in France. Bradshaw & Blacklock were a Licensee of George Baxter's patented Process and their factory was based in Manchester.